Stadium Financing County issued bonds serviced by car rental and hotel tax. The Kingdome is dedicated to providing a multipurpose, self-supporting entertainment facility which presents quality events in a clean, safe, pleasant and accessible environment. Our friendly, courteous employees offer professional support and response services to all our tenants and to the patrons attending our events. 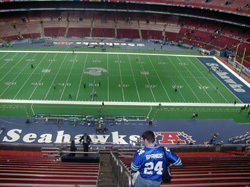 The Kingdome is a multi-purpose stadium owned and operated by King County. The 9.1 acre concrete-domed building is home to two major sports teams, successful continuing trade and consumer shows, big-name concerts, and family-oriented activities. 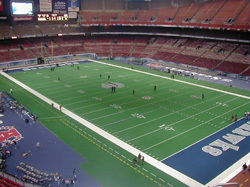 Depending upon the event, the stadium can seat up to 66,400 people. Besides providing an arena floor of 155,400 square feet and 35,000 square feet on the 100 level to prospective tenants, the Kingdome also offers 90,747 square feet in the Pavilion. The stadium has several meeting rooms with banquet facilities, and three parking lots that are leased for special events. Since opening in 1976, close to 3,000 major events have been held, drawing more than 58 million visitors. The Kingdome is the largest exhibit facility north of San Francisco and provides this region with the only public assembly complex able to host the Seattle International Boat Show, the Seattle Home Show, the Seattle International Auto Show, and many other large expositions. In 1985, King County and the Seattle Mariners Baseball Club amended the baseball use agreement to allow the club to assume all responsibility for advertising in the stadium. In 1986, the Seahawks Football Team and King County amended the original football use agreement giving the Seahawks marketing rights to the 48 executive viewing suites. The Seahawks handle marketing of the suites for every Kingdome event and receive 10% sales commission and 50% of net revenue. The Mariners pay the County a general advertising payment each year and retain 75% of all new advertising revenue. Cost: $67 million, $40 million paid in bonds. The rest in loans, federal grant, private funding, and bond investments. 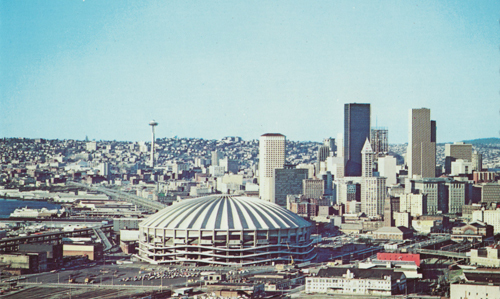 "When the Kingdome opened on March 27, 1976, it was viewed as the Emerald City's ultimate jewel - a multi-purpose complex that could house an NFL team as well as a Rolling Stones concert. But after weathering many Seattle winters, the old gray dome ain't what she used to be - as evidenced by the recent collapse of a roof section and roof tiles. The latest face lift was a $6 million improvement project intended to correct a situation that prompted one local radio talk show host to dub the Kingdome the "world's largest Chia Pet." The ongoing endeavor will strip the dome's roof to its concrete base and will replace an easily discolored and seemingly always dirty layer of white foam with epoxy. What the Kingdome does have is location. It sits just north of Interstate 90, the main freeway linking the city to the suburbs east of Lake Washington. And it's just west of Interstate 5, providing easy access from the south and north. 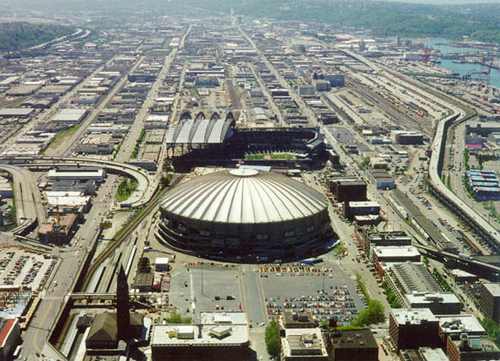 It's also just south of downtown, so the Kingdome anchors Seattle's still-growing skyline. It also helps that Seattle has always been a football town. Fans embraced the Seahawks from Day One, and on game days they arrive early, leave late and scream themselves silly in between. Two players' strikes, the sale of team and a continuing rebuilding process have helped end the honeymoon, but the love affairs burns on." July 19, 1994 The roof had four acoustic tiles fall into empty seats hours before the Mariners' scheduled game against Baltimore. Before the August 12th strike halted the season, the Mariners had to spend the final 22 days on the road. The Seahawks played their first three home games at University of Washington's Husky Stadium before the Kingdome reopened November 5, 1994. April 2, 1997 - Wire Services: The Washington state senate narrowly passed a package of taxes to fund a new $425 million football stadium demanded by billionaire Paul Allen as part of his plan to buy the Seattle Seahawks. While the Kingdome is being torn down and their new stadium is being built, the Seattle Seahawks will call the University of Washington's Husky Stadium home. Approval is still needed by the university's board of regents and the city council because of traffic issues. The team will pay $305,000 per game in rent for each game and it will not be allowed to sell alcohol during the games. The team also cannot play games on weekdays.